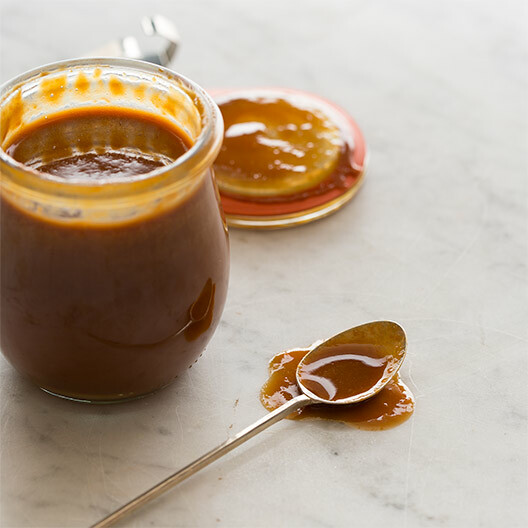 This Cajeta, a sweet and decadent spread/topping that is similar to dulce de leche, but made with goats milk. Simple and delicious! 1. In a small pot, stir together goat milk, sugar and salt. Simmer over medium- low heat until sugar dissolves, 2 to 4 minutes. 2. In a small bowl, stir together the remaining ingredients. Pour baking soda mixture into the goat milk mixture and stir together. 3. Continue to simmer for 1 hour 15 minutes to 1 hour 30 minutes, stirring frequently. 4. Once the mixture is thick enough to thoroughly coat the back of a spoon and has turned a caramel color, remove from heat and pour mixture into a sterilized jar. 5. Tightly seal the jar and can in a water bath, or method of your choice, until the jar is properly canned. 6. The mixture will thicken as it cools. Spread onto cookies or crackers or gently warm and pour onto ice cream, pies, cakes, etc.